Last June 9 (Sun), my son finally learned to ride on 2 wheels. What was amazing for me about this is that I did not do anything to prompt him from doing so. He just decided that Sunday afternoon that he wanted to go out and learn it on his own. 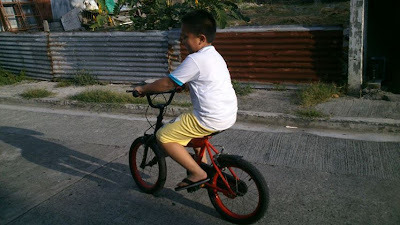 With the help of some neighborhood kids and Ate Arvie, he tried over and over until he finally learned to do it. I also learned one thing that day. I learned that sometimes a mom needs to step back a little and let kids learn on their own, discover things by themselves. Today, I took that step. I was feeling a little under the weather and I took some time off to rest. After an hour or two, my son rushes into the bedroom holding his tablet showing a video of him riding his bike with no trainer wheels. So proud of you Ethan! Another check on your achievements list this summer.